Caucasian Ovcharka, Caucasian Sheepdog, Kawkasky Owtscharka, or Kaukasische Schaferhund—the breed gets its name from the Caucasus mountains, which are home to one of the oldest living Molosser dog breeds. A powerful, solemn guardian breed, the Caucasian Shepherd can be fearless, self-confident, and fierce when they detect a threat, but with proper training, they can also become a devoted, loyal, and affectionate family pet. Coat and Color: Ranges from short to heavy. Color varies—can be a single solid color, brindle, or spotted. In existence since ancient times, the Caucasian Shepherd has been used for centuries to protect properties from trespassers and guard livestock from predators such as wolves and coyotes. Its first official Western Show-Ring appearance was in the 1930s in Germany. There is great variety in Caucasian dogs depending on their home region; throughout history, this breed was introduced into the bloodlines of many of today’s world breeds. The Caucasian dog is considered to be a close relative of the sheepdogs of the Balkans and mastiffs of Asia. These massive, bear-like dogs are particularly similar in appearance and nature to the Tibetan Mastiff, as they are both working dog breeds with a long history protecting stock and flocks in Europe and Asia. The Kavkaz (Caucasus) mountain range of Eastern Europe has been home to many different cultures throughout the centuries, including territories of Armenia, Turkey, Iran, and many others. Historically, Caucasian Shepherd dogs were used for the guarding and safe-keeping of herds, flocks, and homes from predators. The first mention of a large molossoid dog, which was used by the army of Armenian Tsar Tigran the II, dates from the first century BC—however, selection work with the breed started in the 1920s in the USSR to develop personality traits, such as physical strength, fearlessness, sharp hearing and sight, endurance, and self-confidence, as well as a dense, waterproof coat. Selective breeding has allowed people to use Caucasian Shepherd dogs in all kinds of climates, including those with more severe conditions. For nearly a century, there have been two breed types and standards of the Caucasian Shepherd: the Mountain type, a long-coated dog with a heavier body mass, and the Steppe type, a shorter-coated, lighter dog. These dogs historically served an important role to shepherds in the Caucasus mountains as guard dogs; they defended sheep from predators like jackals, wolves, and bears. 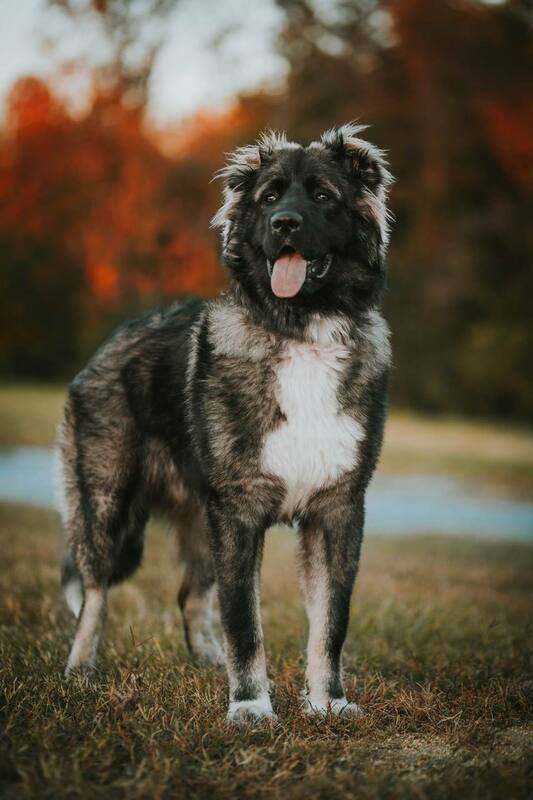 The Caucasian Molosser breeds were used for centuries to protect properties, kill wolves, and guard livestock, and today the Caucasian Shepherd still serves its role as guard dog in states like Georgia, where the shepherd life would be impossible without their protection. In modern times, particularly in the West, they’re commonly used as both companions and watchdogs. Caucasian Shepherds are also used as show dogs under the name of Caucasian Ovcharka. They remain one of Russia’s most popular working dog breeds for flock protection, as guard dogs, and in the show ring. The Caucasian Shepherd Dog is a fully standardized breed, recognized by major kennel organizations including the American Kennel Club and the United Kennel Club. An intelligent breed, the Caucasian Shepherd can be stubborn, strong-willed, and insolent at times. They require a great deal of training because with incorrect handling, this breed can become aggressive towards other people and animals. The average Caucasian Shepherd is assertive and courageous, as well as brave, strong, and alert. Thanks to their history as a watchdog and protector, the Caucasian Shepherd is extremely territorial and can become aggressive when it feels its family is being threatened. Although certain variations can become more vicious than others, they can all be dog-aggressive and suspicious of strangers—as such, the Caucasian Shepherd requires early socialization as well as consistent, experienced handling and training. Providing plenty of exercise and play time can help prevent obesity in the Caucasian Shepherd, as certain variants of this breed are considered low-activity and seemingly lethargic when they aren’t working—which is when they can quickly become alert and agile. Due to their working life in the mountains, these large dogs are well-suited for outdoor endurance activities, such as hiking. Overall, the Caucasian Shepherd is a generally healthy and long-lived breed with the proper care. This breed has been associated with some health issues such as hip dysplasia, obesity, and heart problems. A Caucasian Shepherd dog will require a formula tailored to his unique digestive needs throughout his or her various phases of life. It’s recommended that owners continue to feed your Caucasian Shepherd puppy the food recommended by your breeder until the puppy is at least six months old. As your dog ages, you can consider breed-specific formulas for breeds of various sizes that are manufactured by many dog food companies, but try to avoid kibbles with low-quality ingredients, as these aren’t easily digestible. Clean, fresh water should be made available to your dog all times. The aggressive nature of the Caucasian Shepherd makes it one of the riskier dog breeds to own because it will routinely snap at strangers or anyone they perceive as a threat, so it will require training by someone who is experienced. Unless properly socialized and trained, the Caucasian Shepherd could potentially exhibit ferocious, unmanageable behaviors. A Caucasian Shepherd requires training by someone with experience working with these types of large, guardian dogs, as they are independent, and strong-willed dogs from puppyhood. As such, they may not be the best choice for a first-time pet owner, someone who lives in a smaller home without ample outdoor space, or one with small children or other pets. When properly trained and socialized, this breed can become an excellent family dog due to its protective, loyal nature and ability to be very affectionate and loving. If you’re interested in similar large dog breeds, consider these dogs. A little research will help ensure you find the right pet to complete your family. Otherwise, check out all of our other dog breed profiles.